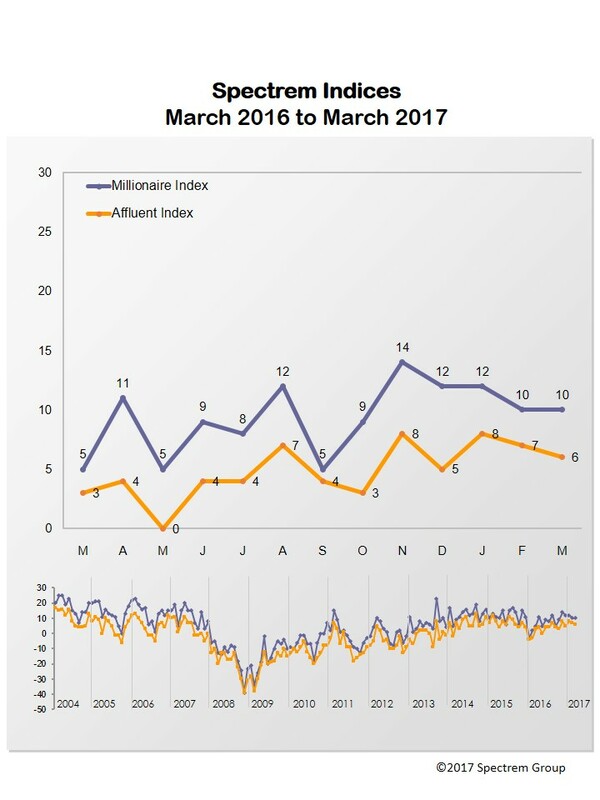 Affluent investor confidence was flat for the fourth consecutive month on record highs in concern about the U.S. political climate, according to the March Spectrem Affluent Investor Confidence indices. The Spectrem Affluent Investor Confidence Index (SAICI®) edged downward one point to 6, while the Spectrem Millionaire Investor Confidence Index (SMICI®) was unchanged at 10. Both indices were higher than in March 2016. The monthly Spectrem Affluent Investor Confidence indices track changes in investment sentiment among the 16.3MM households in America with more than $500,000 of investable assets (SAICI), and those with $1MM or more (SMICI). This month’s survey was fielded between March 16-22, 2017. What happens in Washington D.C. doesn’t stay in Washington. When asked what they consider to be the most serious threat to achieving their household’s financial goals, 30 percent of Affluent investors cited the political climate. This is the highest percentage in the 13-year history of the Spectrem Affluent Investor Confidence indices. This in part offset an increase in confidence in the economy as reflected in the March Spectrem Affluent Household Outlook, a monthly measure of four financial factors that impact the daily lives of affluent investors, and is one of the drivers of the SAICI and the SMICI. At 26 pts., the overall Outlook was flat for the fourth consecutive month, but it is up 6.2 pts. from the same period in 2016. In fact, all of the Household Outlook components—Household Assets, Household Income, the Economy and Company Health—are up over March 2016. Confidence in the economy rose to a 25-month high, but confidence in Household Income was down. Household Assets and Company Health showed little change over the previous momth. Another driver of the Sprectrem Affluent Investor Confidence indices is how Affluent investors intend to invest in the coming month. In March, they were on the one hand perhaps looking to catch the wave of what had been the post-election rally, and on the other, looking to increase their fixed income investments. The month began at an historic high as the Dow Jones industrial average surpassed 21,000 for the first time. But during the period when Spectrem Group surveyed Affluent investors as to how they would invest in the coming month, the Dow began an eight-day slide. The Dow was down around 1 percent for the month, but it was still over 20,000. Also during the period, the Federal Reserve increased interest rates for the second time in three months, but indicated it would continue to move slowly because of the economy’s slow growth. Almost 35 percent of Affluent investors said they intended to invest in equities in the coming month. This was up 4 percentage points from February 2017 and up 4.4 percentage points from March 2016. Of these investors who are Millionaires, intention to invest in Equities is at a 19-month high. But at the same time, 12 percent of Affluent investors said they intend to invest in bonds, up just over 4 percentage points from the previous month and at its highest level since April 2012. At 24 percent, intention to invest in cash in the coming month was up almost 4 percentage points from the previous month, but down almost 2 percentage points from March 2016. At 34.80 percent, intention to hold on the investment sidelines was up only 1.2 percentage points from the previous month, but down 2 percentage points from March 2016.